Sherry and Chris, a military couple who had just returned from serving overseas, celebrate becoming husband and wife at the end of their wedding ceremony in Jackson Square on this lovely June afternoon. The group then second lined to Arnaud's for the reception. 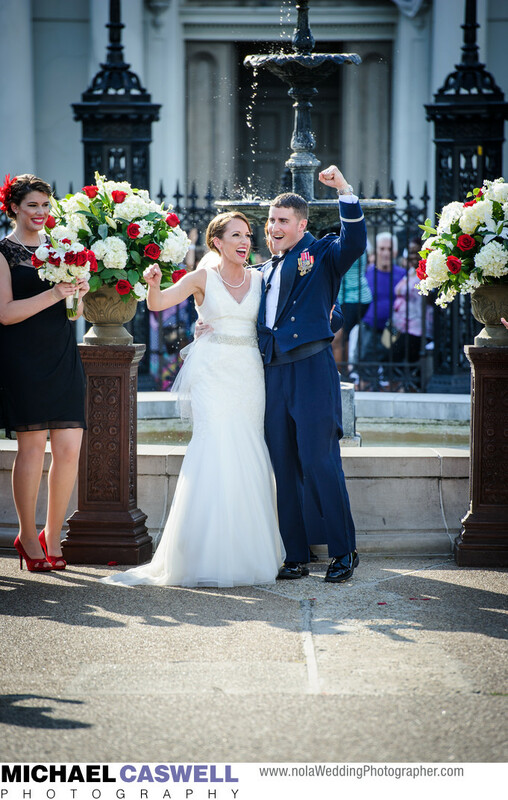 Named for famed general and later president Andrew Jackson, hero of the Battle of New Orleans, this popular park's central location in the French Quarter is convenient to many other fantastic reception venues as well. Muriel's is right next to the park, and the Pharmacy Museum is just down the street. The Bourbon Orleans and Omni Royal Orleans hotels are nearby, as is Latrobe's on Royal. All of these venues and more are within easy walking distance of the Cathedral, so a festive second line parade with a brass band through the streets of the Vieux Carre is a fantastic way to move everyone to the reception in true New Orleans tradition! This event was coordinated by Brittani Adams of Unique Weddings in New Orleans.